Much like chefs, business professionals can improve team and individual productivity by refining their operations to limit waste and extraneous emotion. By applying concepts of organization to design, we can create better, more efficient customer experiences for the end user. The biggest barrier to “working clean” is falling into the extremes by either wanting to be perfect, or not caring enough. By acknowledging strengths and weaknesses, you can iteratively improve them over time. The world’s best chefs must run a kitchen with great efficiency to produce enormous quantities of high-quality dishes – quickly, and in a stressful environment. How do they do it, you ask? Mise-en-place” is a French culinary phrase which literally means “putting in place”. It’s well known in the culinary world. But it’s more than a phrase. It’s a way of life marked by readiness and engagement. 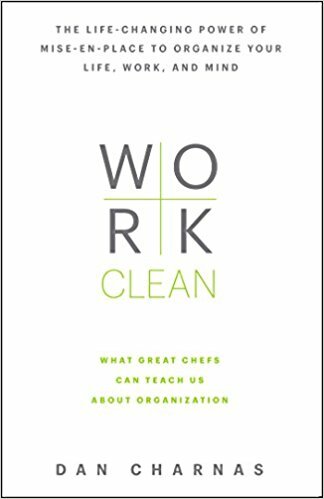 In his book “Work Clean: The Life-changing Power of Mise-en-place to organize your life, work, and mind”, Dan Charnas takes an ethnographic look at a number of chefs to uncover and dissect the overriding philosophical system chef’s deploy to focus, rid themselves of distractions, and deliver results. He narrows it down to 10 key mise-en-place ingredients that bring value to all work environments regardless of industry. 2- Arranging Spaces, Perfecting Movements Chefs have to be meticulous about their use of space and movement – their tools and ingredients being within arm’s reach. Keep desktops well organized, important files easily accessible, meeting spaces prepared, and project workshops on task. Design clean and organized interfaces to support online tasks (e.g. : Geisinger’s Digital Front Door.) Use personalization for information relevancy. 3– Cleaning as you go Chefs clean as they go to keep their workspaces efficient, dishes moving, and avoid a laborious cleanup process. Clean physical and digital environments (files, browsers tabs, notes, workspaces) as we go to make our work more efficient. Consider the user’s context at all times and only surface needed information, tools and functionality for a clean, distraction-free design. 4– Making First Moves A Chef’s first moves (prep) of the day can save time later by readying for the day’s activity – such as putting a pan on the burner to mark work that needs to be done. Engage clients early in work that requires their input such as SEO, personalization, accessibility, content creation, etc. Help users make the “first moves” in interfaces via alerts and notifications (such as signing up to be notified when a doctor or service becomes available). 5- Finishing Actions Chefs avoid the hidden costs of stopping by completing task steps in order. If not possible, they make it as easy as possible to finish later. When wrapping up a design, document, or code – take a few extra moments to make sure it’s completed rather than leave loose threads. Remove obstacles to task completion (e.g. : Amazon one-click purchasing), while also allowing users to easily resume (and be reminded of) action processes they may have abandoned. 6- Slowing Down to Speed Up Chefs can improve the quality of their work by not panicking or rushing, valuing precision over speed, and taking time to better plan their work. Validate a finding, correct a typo on a screen, or even fix a line of code prior to launch to save countless hours fixing errors post-launch. Alert a user in advance if a workflow requires her to have certain information (such as a plan ID), and warn the user before she performs an action that cannot easily be reversed. 8- Call and Callback Chefs use a method called “Call and Callback” to confirm that they’ve heard orders coming in by repeating the order. They value brevity and avoid long meetings. Keep emails short (favoring bullets over long prose) with clear action items. Respect and actively listen to one another Prune out unnecessary words to ensure content is tight, interface elements are concise, and labels are intuitive. 9– Inspect and Correct Good chefs remain vigilant, approach perfection, submit to critique, teach self-critique, and fix and use mistakes. Use iterative check-ins with stakeholders, usability testing and A/B testing as a means of inspecting and correcting design work. Ensure that users are able to clearly inspect and correct important information before submitting it. Provide clear error validations and steps to resolution. 10– Total Utilization Chefs abort waste in all forms, including wasted motion, time, food, money, and even wasted emotion. Be mindful of weighing the costs of time (a non-renewable resource) and money to pursue certain solutions. Find innovations to eliminate waste for both patients and providers, such as telemedicine. Design intuitive interfaces that eliminate long scrolling or too many clicks. At Red Privet, we strive to incorporate these 10 principles into the standardization of how we design great customer experiences. The best chefs continue to use mise-en-place even as they move up the corporate ladder, stop cooking, and start managing. So should we as business professionals. Because like the kitchen, the healthcare industry is dynamic. Our goal is create a proactive philosophy and system of organization that delivers consistently high quality projects in the midst of ever changing circumstances.